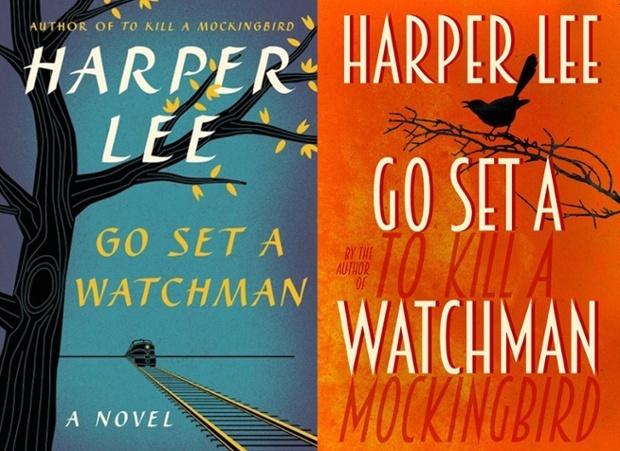 When The Guardian published an article on its website in the same week about the book jackets for the release of Harper Lee’s sequel / prequel to To Kill A Mockingbird, I thought some balance may be restored. In fairness to The Guardian at least the article is about design, and they did invite designer Stuart Bache to critique the covers for an accompanying piece, (which he does excellently). But what really annoyed me was that no designer’s names are mentioned at all in either article. I don’t blame The Guardian for this, as none of the stories I’ve read about these jackets on any other website mentions the designers involved either. This suggests that for some reason the publishing houses aren’t mentioning names, (the book is being released by different publishers in the UK and the US). It maybe standard for in-house designers not to be given publicity—although I’d hope their names will be on the actual release somewhere—but both William Heinemann (UK) and HarperCollins (US) are heavily publicising these design previews to generate free advertising in the press in the run-up to the July publishing date. I think it is a shame that none of the articles I’ve read in regard to these jackets chooses to question why such anonymity exists when it comes to graphic design, and this in itself maintains the status quo of graphic design not being treated with the same esteem as other arts disciplines. While at least Bache mentions the covers are designed by designers and The Guardian did seek him out as an expert witness, it would be good to read journalists questioning this lack of credit as they surely would do if this was the preview of a tie-in artwork by an actual proper artist.